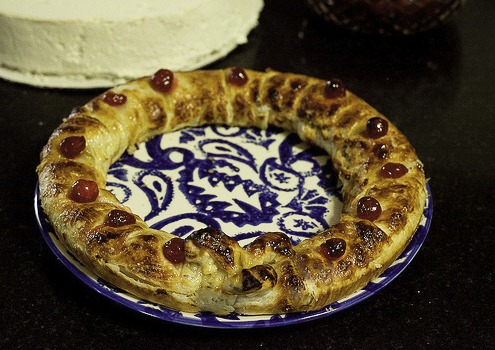 Time for a delicious Christmassy recipe. This time, the very Dutch krestkrans, filled with with almond paste and enveloped in puff pastry, the recipe given to me by my wonderful grandmother (although to be honest, whenever she made this she just threw things in without a strict recipe). 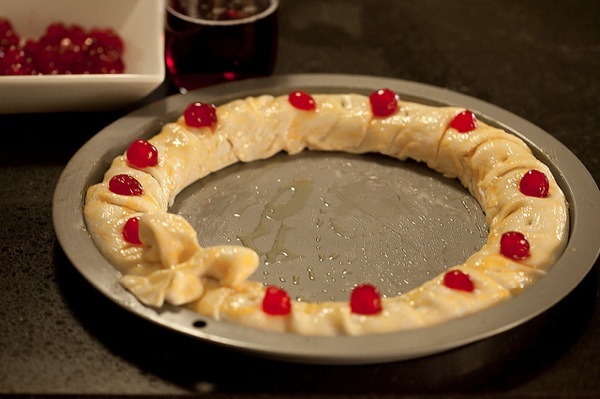 This can be fashioned into a wreath, as seen here, or simply into straight lines. The earlier you can prepare the almond filling, the better. We prepared ours a month before making the kestkrans and stored it in the fridge. Grind the almonds in a food processor and combine with the egg and lemon rind. Store this in a jar in the fridge and resist temptation to sample before Christmas. I used shop bought puff pastry, but you can always make this yourself should you feel so inclined. On kestkrans day, take your almond paste from the fridge and taste a little to help inspire you, then remove the rest from the jar and kneed it a little. You can always add a little water if it is a bit dry. 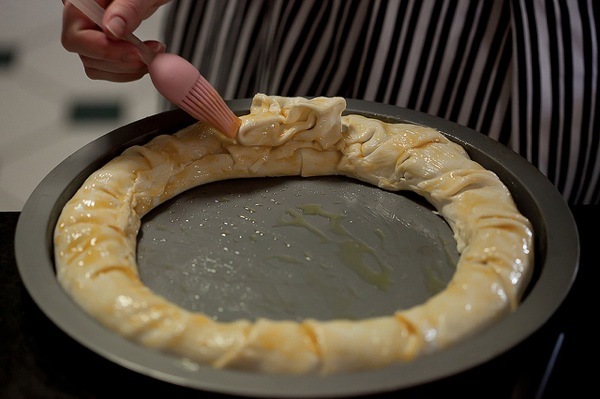 After bushing the pan with some melted butter, cut the puff pastry and line the pan with it, adding a filling of almond paste, and then covering with the remaining puff pastry. Bake in the oven for 20 to 25 minutes, until nicely puffed and a beautiful golden colour. Let cool a little and then cut into little pieces and enjoy! The perfect start to Christmas. This looks amazing! I have to try and make this. Imagine the points I’ll get with my Dutch in-laws who will be here in the US with us for Christmas.